Our fast-paced dynamic lifestyle leaves us with plenty of stress and little spare time, and is usually the reason that most of us do not eat properly. Osem crackers offer the perfect solution–they’re tasty, nutritious and always on hand. Everyone can find a cracker that suits their needs. 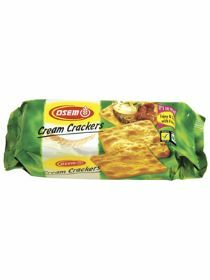 Osem crackers help to maintain a healthy and balanced diet. Osem Lachmit crackers are rich in dietary fiber and aid digestion; Cream Cracker Plus and Sesame Plus are calcium-rich crackers that help build strong bones. Osem’s Prichonim rice cakes, an integral part of our daily diet, come in different shapes and sizes from regular round to very slim squares (only 16 calories) to honey-flavored Prichonim snacks for guilt-free nibbling. And when visitors drop in or you just want to be pampered, there’s nothing like slim-line crackers with sesame and nigella (black cumin) seeds, pesto or onion. They’re so tasty you can’t stop nibbling.